An important and exciting utilization of nuclear data is to understand the cosmos. Thermonuclear processes in the Universe determine the composition of our world and play a major role in its structure, evolution, and eventual fate. Nuclear science is important, for example, in the fusion of hydrogen and helium nuclei just a few minutes after the Big Bang, in the conversion of protons to neutrons during the collapse of the core of a massive star, in the capture of neutrons on heavy seeds above the surface of a newly formed neutron star, and in many other cosmic phenomena (see figure at right). The implications of nuclear processes are evident not only far out in space and back in time, but also in our everyday life: our bodies and our world are composed of the thermonuclear ashes of long dead stars, and the food chain on Earth and the stars we see twinkling in the night sky depend on the fusion of light nuclei deep in the cores of stars. In many cases, predictions of simulations of such diverse phenomena depend sensitively on nuclear physics input. 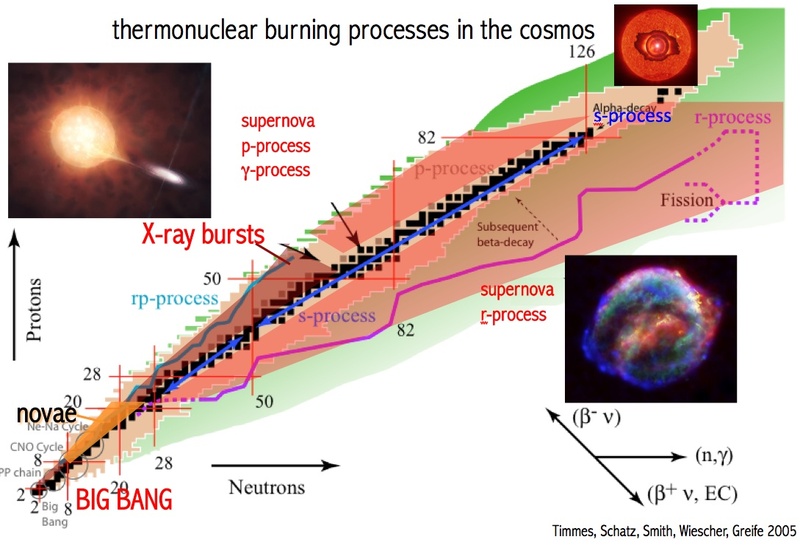 For example, the flux of an X-ray burst has a qualitative and quantitative dependence on the half-lives of proton-rich nuclei above Iron; the heavy elements synthesied in supernovae depend on the masses, decay lifetimes, and neutron capture cross sections of neutron-rich unstable nuclei; and the sensitivity of sophisticated satellite observatories to nova outbursts depends on the rates of reactions on proton-rich exotic nuclei. As these astrophysical simulations become more and more sophisticated, they require more nuclear data. 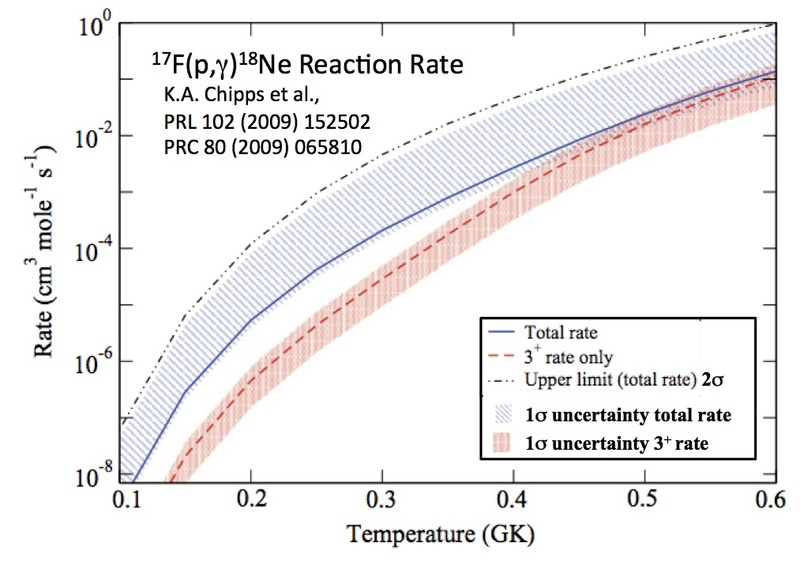 Furthermore, more precise nuclear data is needed to improve the quality of their predictions and, in cases such as supernova simulations utilizing millions of CPU hours on petascale supercomputers, to avoid costly mistakes. Data on a wide variety of nuclear processes are needed for astrophysical simulations - including nuclear masses, capture reaction cross sections, weak decay rates, level densities, and nuclear matter compressibility. This information cuts across the traditional disciplines of nuclear structure and nuclear reactions. Thanks to the growing popularity of nuclear astrophysics studies, as well as advances such as sophisticated detector arrays, intense beams of radioactive nuclei, traps for high precision mass measurements, and global nuclear models running on supercomputers, new data are being generated at an ever-increasing rate. At ORNL, the Nuclear Data Program closely couples structure and reaction evaluations and data processing to astrophysics research on stellar explosions. Structure evaluations of mass chains are done for inclusion into the ENSDF (Evaluated Nuclear Structure and Decay Data File) database at the National Nuclear Data Center. In this effort, we are currently evaluating nuclei with A=69, which includes 69Br whose properties are essential for studying the rp-process waiting point nucleus 68Se in X-ray bursts. 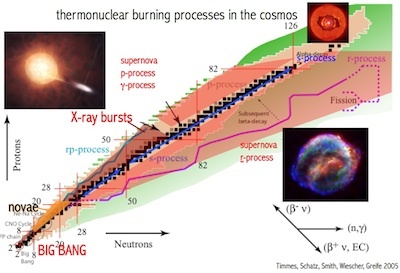 Our evaluations will be used in X-ray bursts nucleosynthesis calculations. We also perform measurements with radioactive beams at HRIBF to understand explosive stellar events. 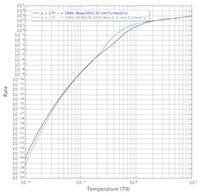 Results from our measurements are assessed along with other work in the field, processed into formats required for simulations, and input into simulations. We then run simulations and visualize the output. This work is greatly streamlined using the specialized and innovative tools developed with a user friendly interface in the Computational Infrastructure for Nuclear Astrophysics. A recent example of the close coupling of our evaluation and processing work with our experimental effort is our work on the 17F(p,gamma)18Ne capture reaction. 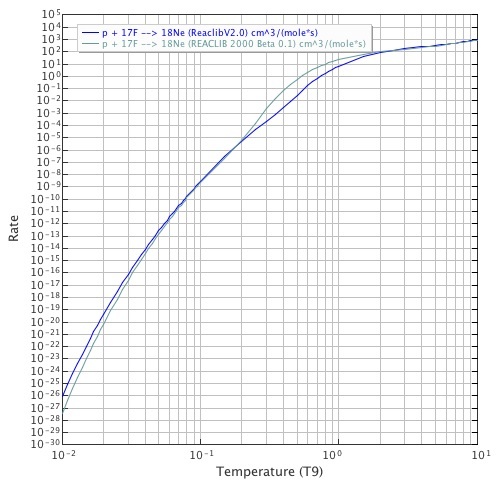 At ORNL, we made the first direct measurement of this reaction with radioactive 17F beam to determine the gamma width of the crucial 18Ne resonance that dominates the 17F + p fusion rate in novae and X-ray bursts. 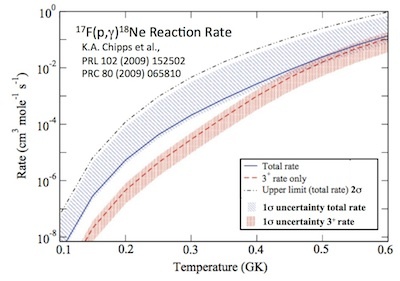 This measurement, coupled with a data assessment, data processing to determine the best thermonuclear reaction rate (see figure at right), and a series of element synthesis calculations, changed the predictions of abundances of 18F and other isotopes that are synthesized in a nova outburst. Another example of our astrophysics data work was our recent detailed assessment and calculations of the low-lying levels in 131,133Sn that were populated in our ORNL measurements of 130,132Sn(d,p)131,133Sn. 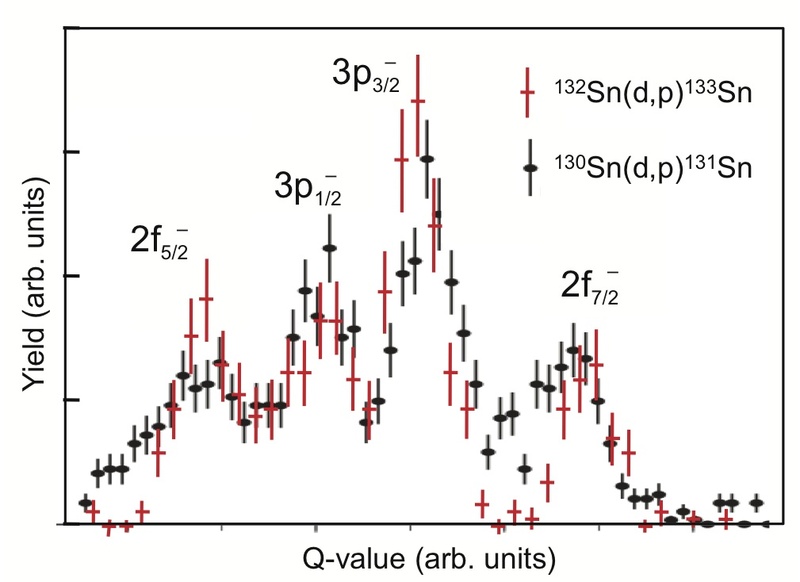 The experimental work indicated consistently high spectroscopic factors for the 133Sn levels, compatible with 1 (the maximum value, for pure single particle states) within error bars for all four cases measured. This supports the conclusion that the unstable nucleus 132Sn is the "best example" of a heavy doubly-magic nucleus measured to date. 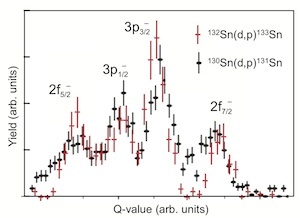 The spectra of 131Sn bound levels is also remarkable similar to those in 133Sn, even though these two nuclei are on either side of the N=82 shell gap (see figure at right). After our assessment of the level information, theoretical nuclear structure calculations were performed to understand the evolution of levels between 131Sn and 133Sn. Understanding the nature of the single particle states outside a double shell closure is essential for predicting the properties of thousands of unmeasured exotic nuclei such as those involved in the synthesis of heaviest nuclei via the rapid neutron capture process in supernovae. We have carried out assessments of levels in a number of neutron-rich nuclei such as 81Ge and 129Sn, coupled to our measurements of 80Ge(d,p)81Ge and 126,128Sn(d,p)127,129Sn at ORNL.